As a rule, in all observed localities more or less depressed specimens of Glyptostrobus pensilis dominate. Commonly largest part of trees in available populations has low vitality. The level of vitality was assessed by estimation of percentage of living part of tree canopy. It ranges from 100% (when all branches of canopy covered with normal healthy leaves) to 0% (when canopy have no leaves in recently died trees). Usual gradation of observed spectrum of tree vitality is illustrated on Fig. 4. Approximate tree age was estimated on the base of calculation of a number of timber rings that are formed annually due to regularly alternating of dry and rainy seasons. In most cases, the age of individual trees was assessed by dividing of half tree bole thickness at d.b.h. by thickness of abstract timber ring calculated as average on the base of analysis of 10 model timber sections (Table 1, Fig. 5). Fig. 3. Seed cones of Glyptostrobus pensilis from native Vietnamese specimens (HAL 11349). A-D: Young and ripening seed cones. E-G: Ripe opening seed cones. H. Longitudinal section of seed cone damaged by fungal infection (photographs of Leonid V. Averyanov). Average thickness of an individual timber rings in studied bole model radiuses varies from 0.83 to 3.85 mm (with minimal and maximal ring thickness - about 0.25 and 7.5 mm respectively). Total average thickness of an individual ring for all studied boles was calculated as 1.88 mm, which may be more or less typical for G. pensilis timber at d.b.h. in studied area. If this true, age of observed trees with boles 4-147 cm d.b.h. ranges between 11-391 years old respectively. 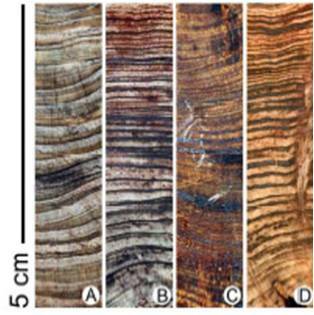 Wide variation of individual timber rings in their thickness (0.25-7.5 mm) gives evidence that G. pensilis trees in some periods of their life grew fairly fast increasing bole thickness annually more than on 1.5 cm. In some other periods they grew much slowly, increasing timber diameter less than on 1 mm each year (Fig. 5). All field observations, descriptions of plant communities and species identifications are based on herbarium collections, which are housed now at Herbaria of Institute of Ecology and Biological Resources of Vietnam Academy of Science and Technology (HN) and Komarov Botanical Institute of the Russian Academy of Science (LE). Description of vegetation, species composition of plant community, horizontal and vertical structure of the forests were made by studies of model plots. Linear dimensions of bole/canopy diameter, high of trees etc., were made by standard measurement methodology. Fig. 4. Illustrations of different levels of tree vitality in studied native stands of Glyptostrobus pensilis. Respectively: A – about 100%, B – 75%, C – 50%, D – 25% and E – 0% vitality (photographs of Leonid V. Averyanov). Monsoon closed semi-deciduous and dry evergreen lowland rich forests were primarily typical on flat basalt plains and low hills of Dak Lak Province. These rich primary woods have been highly affected by human activities about a century ago and were replaced by secondary semi-deciduous and deciduous forests and savanna-like woodlands spreading on thin rather poor, usually ferralite highly degraded soils. As main dominants in these widespread plant formations appear numerous representatives of Dipterocarpaceae and Lythraceae families and some other broad-leaved fast growing trees (Averyanov et al., 2003). At the same time, some variants of relict primary lowland woods of specific habitats certainly included here a number of conifers. Most probably, numerous swampy leveled riverine depressions spreading on plains of Dak Lak Plateau provided ancient, very reliable refuge for relict coniferous forests with G. pensilis before human land reclamation. Now these forests and individual trees almost completely become extinct due to total agricultural transformation of landscapes, wide urbanization, forest fires and damage of hydrological regime of their habitats. Fig. 5. Typical annual timber rings of Glyptostrobus pensilis on 4 selected radial timber sections (A-D) used for approximate estimation of tree ages in studied populations. (photographs of Leonid V. Averyanov). Our inventory field works implemented during 2007-2008 revealed 5 last localities of native G. pensilis stands in Vietnam (Fig. 1). First discovered locality of G. pensilis includes alone native growing tree surprisingly remained on wet stream slope at the centre of Buon Ho Town (12º56’07’’N 108º16’57’’E). Old local stories say about numerous trees growing along wet stream valley in this place years ago, but any actual confirmations of this fact are not available. Observed tree (April 2008) was 19 m tall, 66 cm d.b.h., with estimated age about 176 years and vitality around 55% (Fig. 6A). This tree grows on private land, actually on backyard kitchen garden of local villagers. The survival of this specimen in coming years is highly problematic. The second studied locality of G. pensilis was found near Truong Ha village (Krong Nang District, Ea Ho Municipality, around point 12°59’59’’N 108°17’26’’ E, April 2007 and April 2008). Here were found 5 extant scattered trees 6-15 m tall, with vitality ranging between 100 to 0% (in just recently died trees). Trees were observed in open flat swampy bottom of broad depression lying between low rolling basaltic hills covered with coffee plantations (Figs. 6B, C & G). Elevation of this habitat is 717 m above sea level. Wide present-day excavations of numerous underground stumps, roots and other remains of valuable fragrant G. pensilis timber (Figs. 6D-G) give certain picture of existence of majestic closed mono-dominant coniferous forest in this local area few decades ago. Some trees in this extinct wood reached more than 1.5 m d.b.h. and age at least 400 years old (Figs. 6D & E). Anthropogenic deforestation for rice paddies, forest fires and direct logging were clearly main factors of recent G. pensilis forest extinction in this region. The land here still has no any nature protection status and survival of observed remained extant trees during coming years looks very bleak. At the same time, swampy peaty soils and appropriate permanent aquatic regime of ground water-level create in observed depression rare unique conditions for attempts of G. pensilis cultivation and possible reforestation. Fig. 6. 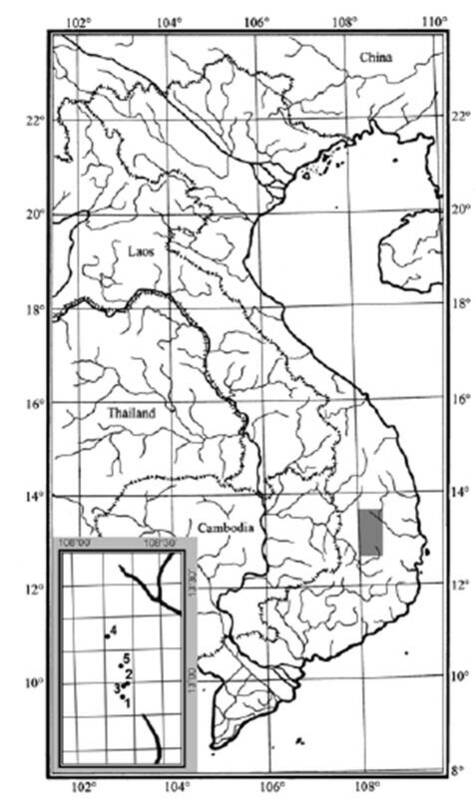 Localities of extant and extinct stands of Glyptostrobus pensilis in Dak Lak Province of southern Vietnam. A: Alone tree discovered on stream slope in Buon Ho town (HAL 11357). B & C: Trees (HAL 11130b) scattered on flat open swampy valley in vicinities of Truong Ha village (Krong Nang District, Ea Ho Municipality). D & E: Stumps of large trees in place of extinct primary mono-dominant coniferous forest in the same area. 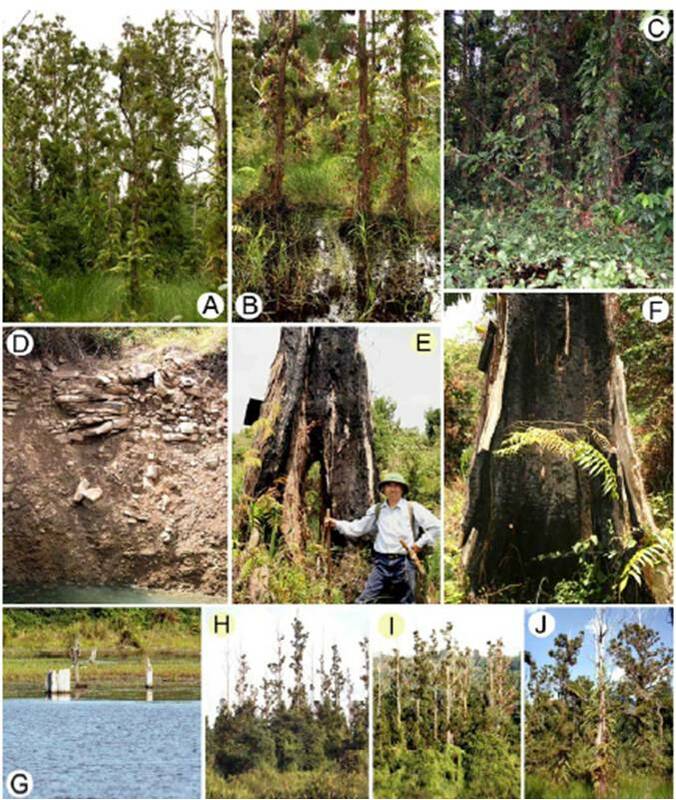 F & G: Excavation of G. pensilis stumps and roots for valuable timber in place of extinct primary coniferous forest in the same area (photographs of Leonid V. Averyanov and Tien Hiep Nguyen). Fig. 7. Map of former Glyptostrobus pensilis forest stand in Trap K’Sor Species/Habitat Protected Area (Dak Lak Province, Krong Nang District, Ea Ho Municipality). Expected area of extinct coniferous forest is marked on the map with red dotted line; solid red line outlines area of still extant sporadically scattered trees. Third G. pensilis locality represents earlier discovered stand that received status of nature protected area known as “Trap K’Sor G. pensilis species/habitat protected area” since 1984. It inhabits broad swampy depression associated with Ea Amuh River valley placed in flat area at elevations about 700 m a.s.l. around point 12º59’12’’N 108º16’50’’E (Fig. 7). Like previous locality, this area belongs to Ea Ho Municipality of Krong Nang District. Inventory fulfilled in April 2008 confirmed occurrence of 34 extant trees (Fig. 8) and indicated their dimensions, approximate vitality, age, actual habits and threats. These data are presented in Table 2. Tree height in this stand of G. pensilis varies from 2.7 to 24 m, diameter of bole (d.b.h.) varies from 20 to 140 cm, specimen’s vitality ranges in limits 5-95% and their approximate ages lie in limits 53-372 years. Average vitality of trees in this population is rather low and rates as about 65.8%. Fig. 8. Scheme of disposition of extant Glyptostrobus pensilis trees in Trap K’Sor Species/Habitat Protected Area (Dak Lak Province, Krong Nang District, Ea Ho Municipality) according to inventory of April 2008. Expected area of extinct coniferous forest is marked on the scheme with red dotted line; solid red line outlines area of still extant sporadically scattered trees. Individual trees are marked with black figures; black quadrate designates position of model plot used for study of extinct coniferous forest. Different kinds of vegetation are marked on the scheme with different color: dark green – close evergreen forest, light green – secondary scrub, yellow – secondary high-tall grasslands, white – short-tall grasslands, pastures and agricultural lands. Observed extant trees of this population scattered now on rather limited territory grow as a component of small fragment of remnant relict primary swamp forest, among secondary swampy shrubs and in open tall-high grasslands (Figs. 8 & 9A-C). Very few trees here have high vitality and form a number of massive air roots rising to 0.5 m tall distant from tree base in radius comparable with radius of tree crown (Figs. 9D & E). At the same time primary area of G. pensilis forest in this region was recently much wider. Numerous stumps and other timber remains of G. pensilis observed here distinctly outline primary area of presently extinct forest as at least three times wider than area of still extant scattered trees (Fig. 8). The study of G. pensilis remains conducted in April 2008 on square of model plot 40 x 40 m (1600 m2) give bright evidence of full extinction of majestic closed full-blooded mono-dominant coniferous G. pensilis woods here few decades ago (point 12°59’10’’N 108°17’11’’E, at elevation 708 m a.s.l.). In many cases, these forests certainly formed closed dense stands with projective canopy coverage approaching to 100% (Figs. 9F & G). Largest trees in this area had boles up to 1.5 m in diameter and were probably as old as 400 years and even older (Figs. 9H & I). Obtained data on approximate reconstruction of horizontal structure of canopy tier of extinct coniferous forest in limits of model plot are presented on Fig. 10 and Table 3. Canopy diameter of extinct trees was estimated on the base of extrapolation of observation of remnant extant trees found in conditions of primary forest. Diameter of canopy was approximately accepted with dependence of diameter of stumps as follow: trees with bole/stump 0.8-1.4 m d.b.h. might have canopy diameter about 6 m; trees with bole/stump 0.5-0.8 m d.b.h. might have canopy 5 m, and trees less than 0.5 m d.b.h. formed canopy about 4 m in diameter. At least 73 stumps were found on model plot square 1600 m2 (40 x 40 m). Projective coverage of coniferous tier with G. pensilis was estimated here as at least 65-70%, but it might essentially higher. Fig. 9. Localities of extant and extinct stands Glyptostrobus pensilis in Dak Lak Province of southern Vietnam. A: Primary mixed forest with G. pensilis in Trap K’Sor Species/Habitat Protected Area (Krong Nang District, Ea Ho Municipality). 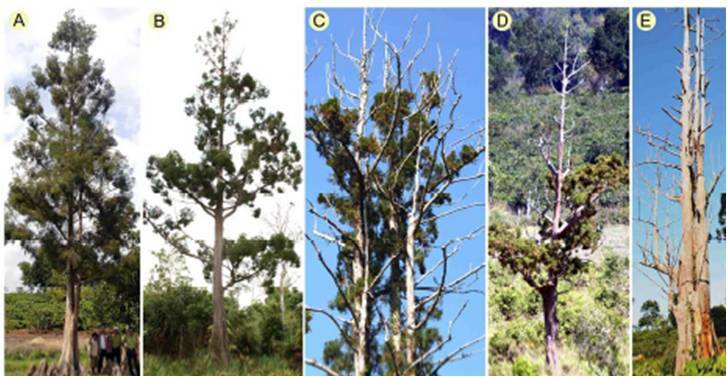 B & C: G. pensilis trees (HLF 7111) of different vitality in primary forest (B) and in secondary scrub (C) on periphery of the same protected area. D & E: Air roots (pneumatophores) typical for extant specimens of G. pensilis in all studied habitats. F & G: Numerous stamps of recently extinct mono-dominant G. pensilis coniferous forest (center of studied model plot) in Trap K’Sor Species/Habitat Protected Area. H & I: Largest stumps of G. pensilis 1.5-2 m d.b.h. with approximate age of extinct trees about 475-550 years old found in the same area (photographs of Leonid V. Averyanov). Largest extant stand of G. pensilis in Vietnam is found presently in specially organized protected area officially called as “Ea Ral species/habitat protected area” situated in Ea H’Leo District, Ea Ral Municipality around point 13º13’54’’N 108º11’03’’E. This locality occupies flat swampy slightly inclined (from SE to NW) depression spreading along small streamlet running between low rolling basaltic hills at elevation about 570 m above sea level (Fig. 11). A dam erected about 25 years ago crossed the streamlet valley. This caused extinction of G. pensilis forest in largest territory of its primary distribution in this locality (Fig. 11). Presently remained G. pensilis stand occupied here square area 10 hectares and numbers about 220 trees (Nguyen Tien Hiep et al., 2004). Most probably, this stand represents last remnant of primary swamp coniferous G. pensilis forest with its original appearance and more or less intact structure (Figs. 12A-C). 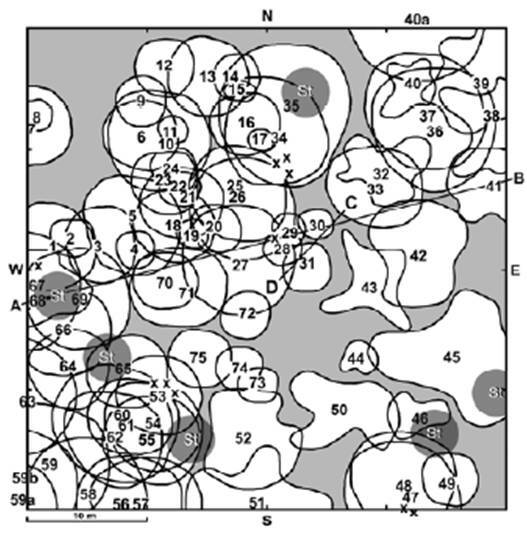 It was studied and described in April 2008 by assessment of representative model plot 1600 m2 (40 x 40 m) placed at the centre of this relict woodland (Fig. 11). Like studied extinct forest in Trap K’Sor Species/Habitat Protected Area this still extant G. pensilis stand includes more than 70 trees on square 1600 m2 forming rather closed growth with projective coverage of the first coniferous canopy tier estimated as about 80% (Figs. 13-15). Tree height varies in this studied forest between 3.5-25 m tall with their d.b.h. ranging in limits 4-95 cm. 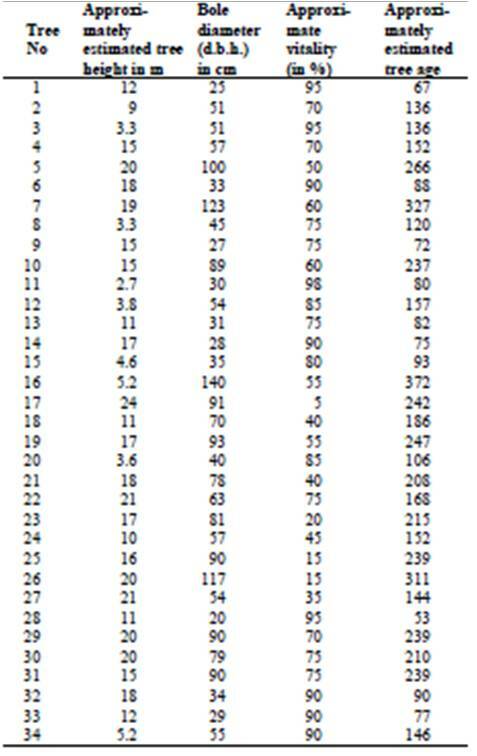 Approximately estimated age of observed and studied trees lies between 11-253 years old (Table 4). However, some old stumps of logged trees occasionally scattered on Glyptostrobus forest territory in this area reach 110 m d.b.h. Age of such trees may be about 295 year. Average vitality of extant G. pensilis trees in this population approaches to 100%. Some trees form here two and even three main erect stems due to early stem particulation (Table 4). Last locality of G. pensilis known in Vietnam designated here as point 5 (Fig. 1). This small population is situated in Chu Ne Municipality of Krong Buk District and includes few very old, highly depressed trees scattered on agricultural lands, secondary grasslands and pastures. The survival of G. pensilis trees in this site is highly problematic, besides this area was declared as “Buon Rah District protection site” being formally officially protected. Table 2. Characteristic of extant Glyptostrobus pensilis trees in Ea Ho Municipality of Krong Nang District (Trap K’Sor Species/Habitat Protected Area). Table 3. 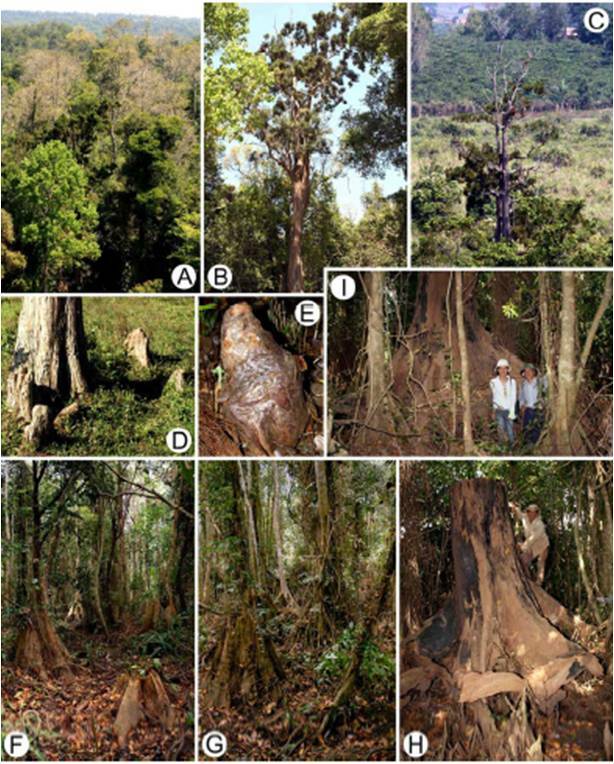 Characteristic of extinct Glyptostrobus pensilis forest in Ea Ho Municipality of Krong Nang District (Trap K’Sor Species/Habitat Protected Area) in model plot of 1600 m2 (40 x 40 m). Fig. 10. Scheme of reconstructed projective coverage of canopy storey in model plot placed in extinct coniferous Glyptostrobus pensilis forest in Trap K’Sor Species/Habitat Protected Area (Dak Lak Province, Krong Nang District, Ea Ho Municipality). Horizontal structure of the first canopy stratum of extant primary G. pensilis forest is shown on scheme of studied model plot (Fig. 13). Continuous coniferous canopy matrix with projective coverage 80-85% includes Fig. 11. Map of former and extant Glyptostrobus pensilis forest stand in Ea Ral Species/Habitat Protected Area (Dak Lak Province, Ea H’Leo District, Ea Ral Municipality). 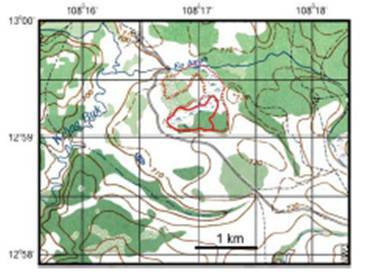 Expected area of extinct coniferous forest is marked on the map with red dotted line; solid red line outlines area of remnant primary coniferous forest; black quadrate designates position of studied model plot. also canopies of few angiosperm deciduous trees (Sterculia pierrei) that appear here as occasional emergents. Projective coverage of angiosperm tree canopies of first stratum in studied G. pensilis forest commonly does not exceed 5%. However, they become dominant in conditions of progressive conifers extinction. Vertical structure of coniferous primary G. pensilis forest is shown by schematic drawings with indication of main dominants of the wood strata (Figs. 14 & 15). Both drawings were made on the base of field observations along transects A-B and C-D marked on studied model plot (Fig. 13). All field observations and species identifications are based on herbarium collections made during 2007 and 2008 years. Remnants of relict primary coniferous forest with G. pensilis that remains in Trap K’Sor and Ea Ral Species/Habitat Protected Areas have similar structure and species composition in all wood strata. Intact primary full-blooded coniferous G. pensilis forest forms mono-dominant first canopy stratum with projective coverage 70-100%. Angiosperm deciduous, semi-deciduous and evergreen trees that reach 20-25 m tall occasionally appear here as more or less common secondary emergents. Among species of this group most usual are deciduous - Sterculia pierrei and Pterocymbium tinctorium, and evergreen - Litsea longipes, Michelia mollis, and some species of Ficus. Similar data were also shortly reported for these forests about 30 years ago (Schmid, 1974). Second forest storey (particularly on open, less inundated plots) includes mostly evergreen broad-leaved trees 7-20 m tall, such as Elaeocarpus sp., Rhaphiolepis indica, some species of Ficus and a number of Syzygium species, like - Syzygium chanlos, S. syzygoides, S. tinctorium and S. tramnion (Fig. 15). On drained depression slopes along swamp forest periphery were additionally observed evergreen Dillenia ovata and deciduous Dillenia pentagyna. Fig. 12. Localities of extant and extinct stands Glyptostrobus pensilis in Dak Lak Province of southern Vietnam. A-C: Primary mono-dominant coniferous swamp forest with G. pensilis (HAL 11406) in Ea Ral protected area (Ea H’Leo District, Ea Ral Municipality); D: One of the wells for the water intake on periphery of protected swampy valley with ground-water level down more than on 3 m below ground surface in Trap K’Sor Species/Habitat Protected Area (Krong Nang District, Ea Ho Municipality); E & F: Slowly regenerating G. pensilis trees highly damaged by fire in the same area; G: Stamps of died G. pensilis trees flooded by deep water of storage pond in Ea Ral Species/Habitat Protected Area; H-J: G. pensilis trees of low vitality depressed by over-inundation on periphery (H, I) and in central part of population (J) in the same area (photographs of Leonid V. Averyanov). Fig. 13. Scheme of projective coverage of canopy storey in model plot placed in primary coniferous Glyptostrobus pensilis forest in Ea Ral Species/Habitat Protected Area (Dak Lak Province, Ea H’Leo District, Ea Ral Municipality). 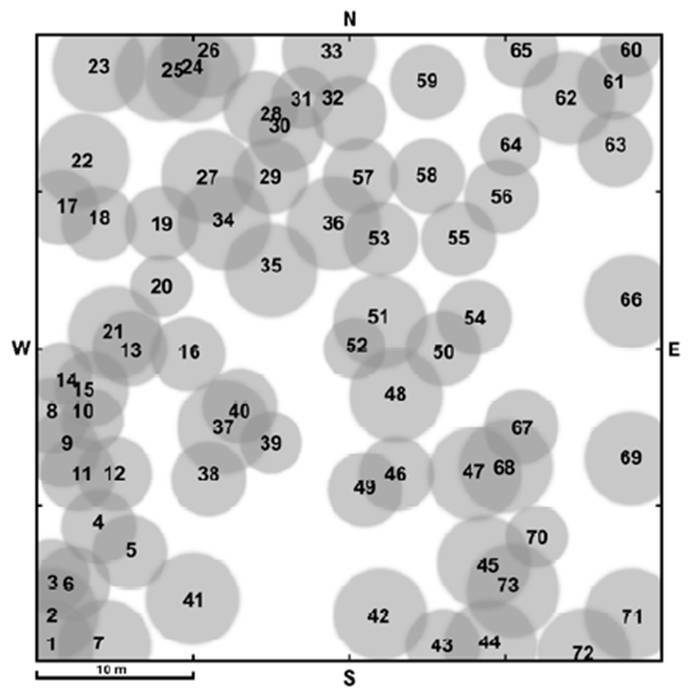 White more or less round spots mean projective coverage of individual canopies of G. pensilis trees, marked with black figures, X – means died trees and stumps; symbol “St” indicates position of Sterculia pierrei trees. Lines A-B and C-D designate transects of studied profiles of vertical habitat structure. Shrub (third) storey of coniferous swamp forest do not exceed 7 m tall and includes a number of shrubs, which form fairly dense thickets in more or less open wet inundated places. Most common species in this group are - Cleistocalyx nervosum, Ilex annamensis, Pandanus multidrupaceus, Rapanea linearis, Syzygium formosum, Glochidion hirsutum, as well as some species of Ficus and Viburnum (Fig. 15). Herbaceous storey has height from few cm to 3-4 m tall and consists of many herbs, ferns, dwarf shrubs, as well as numerous wet loving riparian and sub-aquatic grasses (Poaceae) and sedges (Cyperaceae). Among most common herbaceous species were observed Ardisia aciphylla, Asplenium longissimum, Catimbium speciosum, Donax cannaeformis, Ficus simplicipinna, F. subulata, Floscopa glomerulata, Nephrolepis biserrata, Ophiorrhiza sanguinea. Swamp forest provides also home for a number of wet lowing orchids, like Arundina graminifolia, Calanthe lyroglossa, Calanthe triplicata, Hetaeria sp. and very rare, typical swampy orchid - Dipodium paludosum. More or less common immature seedlings of trees of highest strata additionally participate in formation of herbaceous storey. Vigorous growth of riparian, sub-aquatic and aquatic herbs may be seen everywhere in shallow water (commonly 0.5-1 m depth), particularly in open places. Usual species in this group are Commelina paludosa, Eleocharis sp., Fuirena umbellata, Hydrocera triflora, Lasia spinosa, Ludwidgia perennis, Oenanthe javanica, Scirpus mucronatus, Scleria corymbifera and Utricularia sp. (Figs. 14 & 15). Fig. 14. Vertical structure of Glyptostrobus pensilis swamp forest with emphasis to herbaceous plant species along transect C-D (view from NW to SE) demarcated on scheme of model plot (Fig. 13). 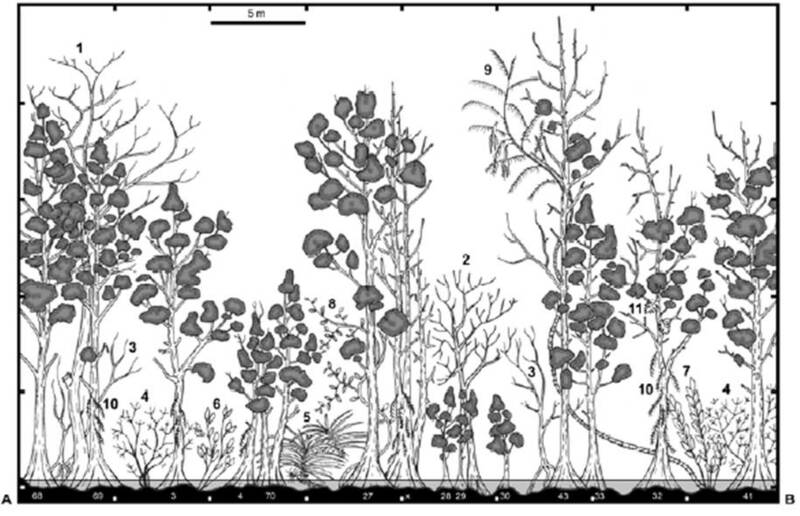 Black figures on the drawing field designate usual co-dominants of plant community as follow: 1: Glyptostrobus pensilis (trees marked on scheme of model plot as № 30 & 31). 2: Donax cannaeformis. 3: Ludwidgia perennis (also Ardisia aciphylla, Commelina paludosa, Ficus subulata, Floscopa glomerulata, Oenanthe javanica and Ophiorrhiza sanguinea). 4: Asplenium longissimum (also Nephrolepis biserrata). 5: Arundina graminifolia (also Calanthe lyroglossa, C. triplicata and Dipodium paludosum). 6: Scirpus mucronatus (also Eleocharis sp., Fuirena umbellata and Scleria corymbifera). 7: Lasia spinosa (also Hydrocera triflora). 8: Flagellaria indica. 9: Nepenthes mirabilis. 10: Catimbium speciosum. 11: Thrixspermum amplexicaule (also Zehneria indica). 12: Rhaphidophora hookeri (also Epipremnum giganteum and Rhaphidophora decursiva). 13: Dischidia major (also Dischidia imbricata, D. nummularia and Hoya diversifolia). 14: Psychotria serpens. 15: Dendrobium crumenatum (also Aerides odorata, Bulbophyllum odoratissimum, B. orientale, Eria pannea, Pholidota imbricata, Thrixspermum centipeda). 16: Taxillus chinensis. 17: Stenochlaena palustris (also Lygodium japonicum, L. microphyllum). 18: Smilax perfoliata. 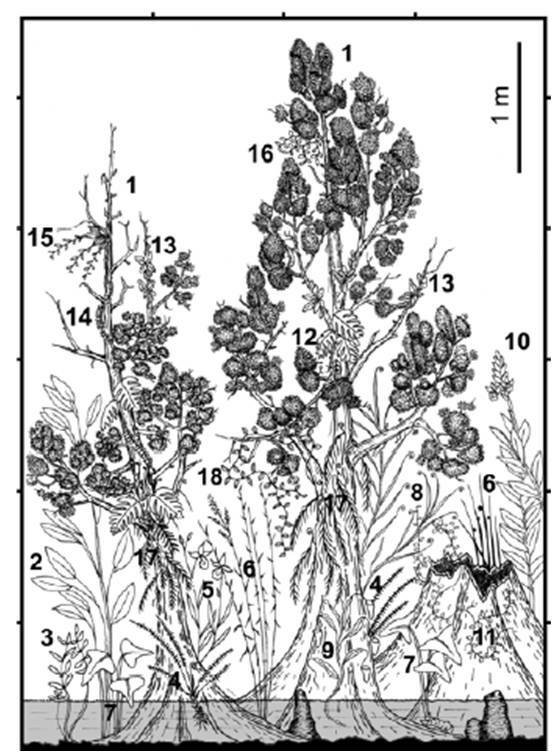 On the drawing are schematically shown only herbaceous (semi-herbaceous) species and G. pensilis trees (drawing of Leonid V. Averyanov). Extra-storey vegetation includes numerous vine and epiphytic plants. Among aboriginal woody lianas that reach 20-35 m long were observed Calamus palustris, Ficus laevis, Mussaenda dinhensis, Spatholobus parviflorus and Poikilospermum suaveolens. All they are not too much common in intact forest. As a main co-dominants in primary swamp forest appears such semi-woody vines as Flagellaria indica, Lygodium japonicum, L. microphyllum and especially Stenochlaena palustris. Last species reaches very high abundance and occasionally may be observed as alone mono-dominant fern-vine covered all tree boles with dense, reticulate cover coming from the ground to their canopies. Less significant, but also very typical here are some small herbaceous vines, like Nepenthes mirabilis, Psychotria serpens, Raphistemma pulchellum, Spatholobus parviflorus and Zehneria indica (Fig. 14). Group of epiphytic creeping herbaceous vines commonly observed in canopies of trees includes such common species as Dischidia imbricata, D. major, D. nummularia, Epipremnum giganteum, Hoya diversifolia, Piper sp., Rhaphidophora decursiva and R. hookeri. Typical epiphytes are also very common here. They are mainly orchid species, like Aerides odorata, Bulbophyllum odoratissimum, B. orientale, Dendrobium crumenatum, Eria pannea, Pholidota imbricata, Taeniophyllum sp., Thrixspermum amplexicaule and T. centipeda. At the base of shady mossy conifer’s boles may be often seen small epiphytic fern – Canopy branches on some old specimens provide home to colonies of small parasitic shrubs from Loranthaceae family, mainly - Taxillus chinensis (Fig. 14). Fig. 15. Vertical structure of Glyptostrobus pensilis swamp forest along transect A-B (view from SSE to NNW) demarcated on scheme of model plot (Fig. 13). Individual Glyptostrobus trees are marked at the bottom of drawing with white figures; died trees are marked with “X”. Black figures on the drawing field designate main co-dominants of plant community as follow: 1: Sterculia pierrei (also Litsea longipes). 2: Michelia mollis (also Pterocymbium tinctorium, Rhaphiolepis indica, Syzygium chanlos, S. tinctorium and S. tramnion). 3: Rapanea linearis (also Ilex annamensis and Ficus sp.). 4: Syzygium syzygoides (also Syzygium formosum, Cleistocalyx nervosum and Viburnum sp.). 5: Pandanus multidrupaceus. 6: Donax cannaeformis. 7: Catimbium speciosum. 8: Ficus laevis (also Poikilospermum suaveolens). 9: Calamus palustris. 10: Stenochlaena palustris. 11: Rhaphidophora hookeri (also Epipremnum giganteum). On the drawing are schematically shown only species higher (longer) than 3 m (drawing of Leonid V. Averyanov). Table 4. 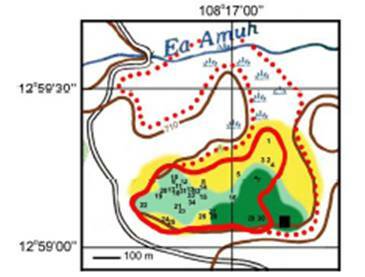 Characteristic of extant Glyptostrobus pensilis forest in Ea Ral Municipality of Ea H’Leo District (Ea Ral Species/Habitat Protected Area) in model plot of 1600 m2 (40 x 40 m). 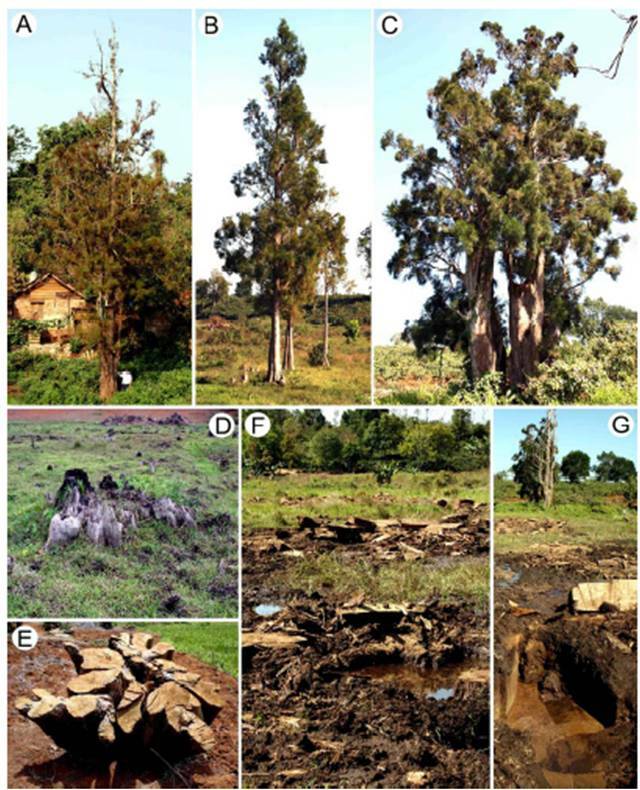 Extinction of conifers and logging of the second and third forest strata lead to formation of secondary scrub, which often degrades into high- and middle-tall secondary grasslands. In our days, such weedy plant communities replaced coniferous G. pensilis forests in nearly all localities of their primary distribution. Seedlings, saplings and immature specimens of some aboriginal elements of primary wood, like Elaeocarpus sp., Ficus simplicipinna, Ilex annamensis, Semecarpus cochinchinensis, Sterculia pierrei, Syzygium syzygoides and Viburnum sp. may be still found in secondary shrub communities, which replace primary coniferous forests. However, invasive secondary woody species, such as Melastoma candidum, Melicope triphylla, Semecarpus cochinchinensis and many others, become dominant here and successively displace all species of primary plant communities. Many fast growing woody and shrubby species of the secondary dry Dipterocarpus forest (typical for surrounding hilly neighborhoods) actively migrate to peripheral parts of degraded swamp forest due to anthropogenic drainage. Among most usual species of this group in our studies were observed such trees as Careya sphaerica, Dillenia ovata, D. pentagyna, Dipterocarpus obtusifolius, Pterocymbium tinctorium, Shorea obtusa and dwarf xerophytic spiny palm - Phoenix loureiri. Open secondary grasslands spreading now widely in places of former coniferous forest retain very few aboriginal species of extinct wood. Commonest of them may be only found in particularly wet open places. They are - Asplenium longissimum, Catimbium speciosum, Commelina paludosa, Donax cannaeformis, Eleocharis sp., Floscopa glomerulata, Fuirena umbellata, Lasia spinosa, Ludwidgia perennis, Nephrolepis biserrata, Oenanthe javanica, Scirpus mucronatus and Scleria corymbifera. Usual dominants here are tall and dense invasive grasses and sedges like Leersia hexandra, Miscanthus spp., Paspalum conjugatum, Phragmites karka, Saccharum spontaneum, Scleria corymbifera and Setaria palmifolia. Many herbaceous and hemiherbaceous vines become very common in such open grassy plant communities. Among them most common are - Argyreia capitata, Ipomoea sp., Lygodium microphyllum, Merremia pierrei, Paederia foetida, Smilax perfoliata and Stenochlaena palustris. Tall sedges and grasses intermixed with numerous vines form very dense thickets that represent stable climax kind of secondary herbaceous vegetation, where natural regeneration of any native forest formations looks hardly possible. Structure and superficial appearance of studied extant G. pensilis populations are different in some details. Variation of extant trees according to their high in Trap K’Sor Species/Habitat Protected Area relatively is not too wide. The population is presented with rather short- and middle-high trees, mainly 3-20 m tall (Table 2 & 5, Fig. 16). Rather low trees in this population grow in more or less open environments, depressed by secondary shrubby and grassy vegetation. Most of these specimens besides their stunt habit are fairly old and seriously damaged by forest fire (Figs. 12E & F). Variation of tree height in Ea Ral Species/Habitat Protected Area population was assessed by study of representative model plot that included 75 trees. Their height varied here in a bit wider limits, mainly from 4 to 22 m tall (Tables 4 & 5, Fig. 16). Trees in this population have higher vitality and grow in closed forest that approximates to primary conditions. Comparative ratio of trees of different height in both studied populations is presented in Table 5 and Fig. 16. Structure of extant and extinct G. pensilis forest according to bole diameter (d.b.h.) was studied in Trap K’Sor and Ea Ral Species/Habitat Protected Areas. 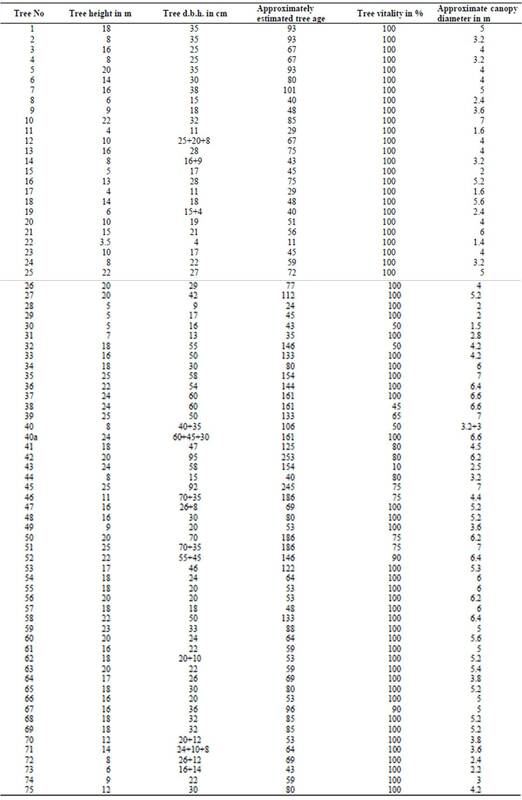 Comparative ratio of trees of different bole thickness (and respectively age) in two extant and one extinct forest stands are presented in Table 6 and Fig. 18. As may be seen from these data, extant and extinct G. pensilis forest in Trap K’Sor Species/Habitat Protected Area have similar structure. Trees of 30-90 cm d.b.h., having approximate age about 80-240 years dominate in both cases. Some trees in these studied stands can reach 140 cm d.b.h. (with approximate age – 370-400 years), but young tree component here almost completely absent. Obviously, youngest trees extinct very fast under negative changing of environmental conditions. Young tree component is much better presented in Ea Ral Species/Habitat Protected Area. Trees 10-30 cm d.b.h. with approximate age 25-80 years form here more than 50% of population. At the same time, individual trees reach 100 cm d.b.h. (about 265 years). Table 5. 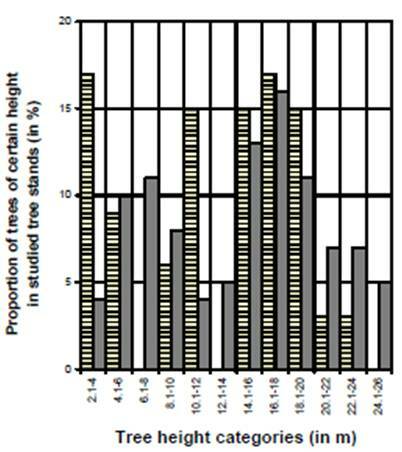 Proportion of different tree height categories in studied Glyptostrobus pensilis stands (in %). Numbers of trees are indicated in brackets. Table 6. Proportion of bole diameter (d.b.h.) categories in studied Glyptostrobus pensilis extant and extinct stands (in %). Numbers of trees are indicated in brackets. Indirectly such data may indicate habitat conditions as more optimal for conifer growth. Forest structure in this case may be typical for ripe climax coniferous forest, which lived in former primary intact conditions years ago when natural regeneration of population was possible. As may be seen from Table 7 and Fig. 17, vitality of G. pensilis trees obviously higher in population of Ea Ral than in population of Trap K’Sor Species/Habitat Protected Areas. However, proportion of decreased trees in both stands is very high, particularly in peripheral zone of population, which actually surrounded by more or less numerous more than half died and died trees (Figs. 12H-J). The rising ratio of highly decreased trees in whole populations indicates to obvious successive their degradation. Fig. 16. Proportion of trees of different height in studied Glyptostrobus pensilis stands (in %). Height categories are marked with columns of line (Trap K’Sor Species/Habitat Protected Area population) and solid gray shading (model plot in Ea Ral Species/Habitat Protected Area population). Glyptostrobus pensilis is one of the most ancient extant conifers in the world, with a history that dates back at least more than 100 million years. Until recently, it was widespread in Northern Hemisphere, but after the last series of glaciations, its populations have been reduced to few small refugees in south-eastern China, central Vietnam and eastern Laos. Wide anthropogenic transformation of landscapes in mainland Southeast Asia during our ages leaded to extinction of last remnant native G. pensilis populations everywhere except 5 miserable close localities in Dak Lak Province at the center of Vietnam (Dallimore et al., 1967; Vidakovic, 1991; Fu et al., 1999; Luu and Thomas, 2004) and few close localities in eastern Laos near Vietnamese border. All present localities of G. pensilis in Vietnam are found at the center of Dak Lak Plateau that belongs to eastern part of South Indochinese floristic province (Takhtajan, 1978, 1986; Averyanov et al., 2003). The natural range of this floristic province with its rather uniform natural conditions includes also wide unexplored lowland and rolling hill areas of Laos (Averyanov et al., 2003). This unstudied basaltic area gives some hopes for future discovery of another unknown native populations of G. pensilis. Nevertheless, available reports on G. pensilis occurrence in Khammouan Province in Laos based on verbal reports of Vietnamese foresters (Luu and Thomas, 2004) never been confirmed by herbarium collections. At the some time, a number of closely allied native G. pensilis populations were recently found in Borikhamxai Province of eastern Laos near Vietnamese border around point 18°01’48”N 105°02’30”E (our personal unpublished data). Fig. 17. 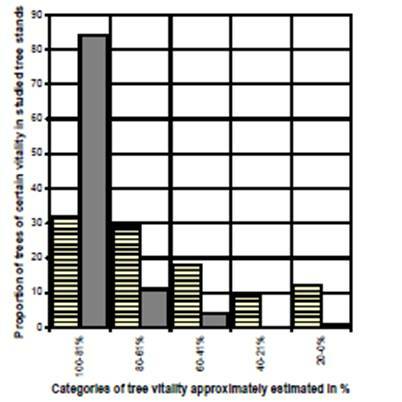 Proportion of trees of different vitality in studied Glyptostrobus pensilis stands (in %). Spectrum of vitality categories are marked with columns of line (Trap K’Sor Species/Habitat Protected Area population) and solid gray shading (model plot in Ea Ral Species/Habitat Protected Area population). Tree vitality of 100% means full-blooded healthy tree, vitality of 0% means died tree; numerous old stumps here were not counted. Fig. 18. 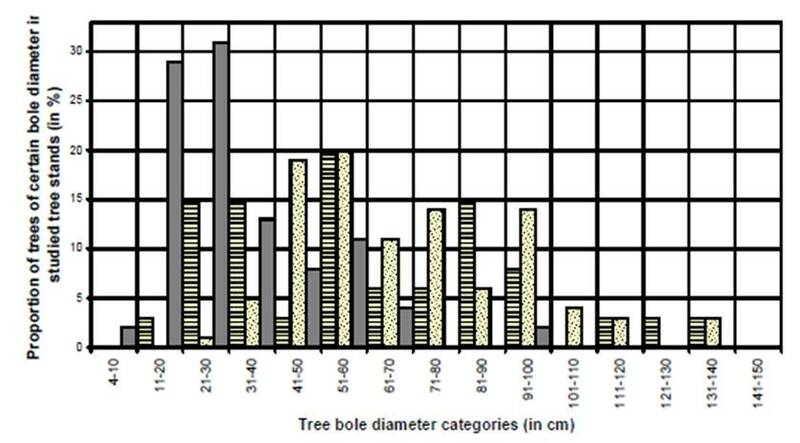 Proportion of trees of different bole diameter (d.b.h.) in studied Glyptostrobus pensilis extant and extinct stands (in %). Spectrum of bole diameter categories are marked with columns of line (Trap K’Sor Species/Habitat Protected Area extant population), dotted (model plot in Trap K’Sor Species/Habitat Protected Area extinct forest) and solid gray shading (model plot in Ea Ral Species/Habitat Protected Area population). Formerly, G. pensilis had, undoubtedly, much wider distribution in central and southern Vietnam, at least in Dak Lak, Lam Dong and Gia Lai Provinces. Already first explorer of Indochina - Jao Loureiro recognized and reported this tree more than two hundred years ago under the name Thuja orientalis as a plant “colitut rara in Cochinchina” (Loureiro, 1793). Later the species was surprisingly missed in fundamental “Flore Générale de l'Indochine» (Lecomte and Humbert, 1907-1951), but was confirmed in a number of following succeeded publications on Vietnamese flora (Le and Phan, 1983; Phan, 1984; Nguyen and Vidal, 1996; Ho, 1999; Nguyen et al., 2004). Noticeable, that all these reports are based on very few collections made solely in two populations survived to our days and studied mainly in our investigation. Meanwhile, the tree was never been reported from northern Vietnam except few uncertain speculative data unconfirmed by any collections (Fu et al., 1999; Farjon, 2005). The logging for excellent fragrant timber and transformation of almost all habitats into rice paddies were leading factors of G. pensilis extinction in the last decades. Up to now G. pensilis timber is highly valued for a fine fragrance and texture, as well as resistance to termites and water. In the past it used widely for cabinetwork, fine art articles, musical instruments and fine furniture. The aerial roots are soft and spongy and were sometimes used for making of different kinds of corks. Presently a number of governmental decrees effectively discontinue any logging of G. pensilis trees in its largest populations. G. pensilis is listed in Group I of the “Rare and Precious Flora and Fauna of Vietnam” (Council of Ministers Decree 18/1992/HDBT, dated 17/1/1992, on Providing a list of Rare and Precious Species of Flora and Fauna and Regulations for their Management and Protection). Under this legislation, reserves and management plants have been established, exploitation and use were forbidden. Further legal protection was given under Law on Environmental Protection (Government Decree 175/1994/CP, dated 18/10/1994 on Guiding the Implementation for the Environmental Protection Law) that was aimed at regulating developments in the surrounding areas. The Dak Lak Provincial People’s Committee declared reserves for both largest G. pensilis populations as “Trap K’Sor and Ea Ral Species/Habitat Protected Areas” in 1994. Management boards and management plans along with guard stations and fences were established (Tordoff et al., 2004; Nguyen et al., 2004). The species was also listed as threatened in Vietnam by the World Conservation Monitoring Centre. Recently G. pensilis was listed in Group IA - Plant species or group of plant species prohibit of exploitation and uses for commercial purpose of the Governmental Decree No 32/2006/NĐ-CP, dated at 30/03/2006 on the Management of threatened, precious, rare native plants and animals. However, in our days negative successive changing of habitats becomes a main factor of decreasing of still remained G. pensilis populations. Largest part of G. pensilis trees in all discovered and studied localities exhibits reduced vitality that indicates present ecological conditions as far from perfect. Permanent lotic inundation up to 1 m depth above swamp peat soils derived from basalt is living important requirement of normal development of coniferous forest with G. pensilis. Such water regime permanently characteristic for Glyptostrobus primary habitats is dramatically disturbed in all remained populations, which now are surrounded by coffee plantations and similar highly drained agricultural areas. In this connection few native growing Glyptostrobus trees discovered outside protected areas in Buon Ho Town and near Truong Ha village (Figs. 1 & 6A-C) have probably no chance to survive for future. All they are located within densely inhabited area. Forest in this region has been cleared for cultivation and most of the surrounding lowlands deeply drained many decades ago. Predetermined extinction of these trees will be certainly very regrettable fact, as such isolated relict former population fragments often conceal very high specific genetic diversity (Li and Xia, 2005). Main damage factor of G. pensilis habitat in Trap K’Sor Species/Habitat Protected Area is drawdown of ground-water in the swampy valley during rainless season due to wide consumption of water from numerous wells situated along periphery of protected swampy area. Regular irrigation of coffee plantations from November till April is living important for successful coffee planting on surrounding lands. Huge drain of water during this period leads to dropping of ground-water level on more than 3 m below ground surface (Fig. 12D) and strong drying of Glyptostrobus habitat substratum. Frequent forest fires during this time seriously destroy habitat burning away shrubs, grasses and fertile peat soil horizons. While fire is a rather frequent event brings no much harm to quite tolerant Dipterocarpus deciduous forests in surrounding lowland basaltic areas, it seriously damages swamp vegetation, which has no any adaptations to this factor. Some largest old G. pensilis trees can survive under swamp burning, but vitality of such specimens become strongly reduced (Figs. 12E & F) certainly moving them to coming extinction. Strong dramatic deficit of water during dry season is obvious and leading factor of Glyptostrobus population decreasing in this locality nevertheless official protection regime, fences and formal monitoring. As long as this factor remains its action, effective protection of the G. pensilis relict stand looks bleak. In such conditions, all remained 34 G. pensilis trees may extinct in this area before the conflict between protective efforts and agricultural industry water consumption will be solved. Ironically, contrariwise to previous example, largest part of G. pensilis population protected in Ea Ral protected area extinct due to raise of ground-water level in its swamp habitat. Dam crossed swampy valley few years ago leaded to formation of water storage pond, which simply flushed half of the forest territory (Fig. 11). Some remnants of largest G. pensilis boles may be seen above water surface of this man-made lake up to now (Fig. 12G). Numerous trees adjoining to the lake did not die, but were strongly depressed by over-inundation (Figs. 12H & I). Unfavorable seasonal over-inundation dynamics, probably, also provide negative influence and even kill trees growing in places of deep water all over the population area (Fig. 12J). Nevertheless, foundation of dam and water storage lake partially can solve principal conflict between G. pensilis population conservation and deficit of water necessary for watering of surrounding agricultural lands. The monitoring and maintenance of optimal ground-water level throughout habitat of G. pensilis, undoubtedly, are first-important actions for effective forest protection. Such action looks quite realistic in this area, why conservation of G. pensilis stand here has certainly better perspectives for future. Effective protection of G. pensilis also needs detailed inventory of all extant specimens in this population. Different reports estimate their number from 100 (Vu, 1996) to 220 trees (Nguyen et al., 2004). However, accurate detailed inventory of all Glyptostrobus trees including small immature specimens depressed in deep shade of lowest forest strata was hardly ever been done. According to our preliminary observation, number of extant trees including small specimens certainly exceeds reported figures. It is remarkable, that reproductive potentials of G. pensilis in all studied localities in Vietnam is very low. Numerous ripening cones observed in spring 2007 and 2008 were damaged with fungal (or bacterial) infection and form no normal seeds (Fig. 3H). In further special study, we find no one normally developed seed, fact that was also reported in earlier papers (Luu and Thomas, 2004). Additionally, no one seedling or saplings were found in all known G. pensilis localities during detailed field works. Youngest found trees were estimated as about 53-98 years old in Trap K’Sor and about 11-40 years old in Ea Ral protected area populations (Tables 2 & 4). Average tree age in both populations was assessed as 194 and 88 years old respectively. Obviously natural regeneration in all studied populations absent at least during last decade, which also was reported by other authors (Luu and Thomas, 2004). It is highly probable that all known populations of G. pensilis extinct in one generation without special measurements and propagation in situ. Accordingly, IUCN (2001) criteria classify G. pensilis as “Critically Endangered” (CR) species (under all mentioned categories: A-E), which certainly approaches to category – “Extinct in the Wild” (EW). It is important to underline that highly fragmented and declined populations of G. pensilis in Vietnam represent last remnants of native swamp coniferous forests, which no more exist outside the country. This globally endangered species approaches now to the verge of full extinction in the wild. It is one of the brightest examples of global floristic treasure and object for conservation of highest priority. Despite all connected problems, the efforts at in situ conservation should be strongly maintained because the swamp G. pensilis community represent assemblage that no longer occur anywhere else (Nguyen et al., 2004). Propagation of G. pensilis ex- and in-situ is probably alone way to save globally significant genetic material of Vietnamese populations for future. The Vietnamese Forest Science Institute has undertaken some positive scientific approaches to this problem (Luu and Thomas, 2004; Nguyen et al., 2004). A major problem here is the lack of viable seeds and the difficulty of rooting of cuttings. Seed collections have been made from remaining Vietnamese trees repeatedly but no germination has been recorded. However, these reports are still based on limited materials. Investigation of all still available mature trees for viable seeds may bring certain success on this matter. Seed cones mature in November - January. In other countries, cones are usually collected when brown, dried and seed stored until spring when they are planted. Successful germination commonly takes about 20 days. Attempts at vegetative propagation have also been largely unsuccessful. A limited number of clones have been successively rooted and are being grown at the Forest Science Institute of Vietnam Research Centre in Dalat City situated at the center of Vietnam (Nguyen et al., 2004). If these clones can be established, then other techniques could be used to produce material for further ex-situ works. It was additionally reported that semi-hardwood cuttings, preferably with a heel from juvenile trees are able root under mist, after treatment with hormones. It is possible to propagate the species from mature trees by cuttings, but rooting percentages are low (about 2% after 10 weeks). Rooted cuttings should be kept shaded. Planting should be done on raised mounds, rather than directly into water logged areas (Luu and Thomas, 2004). Tissue culture is another potential option for species propagation. 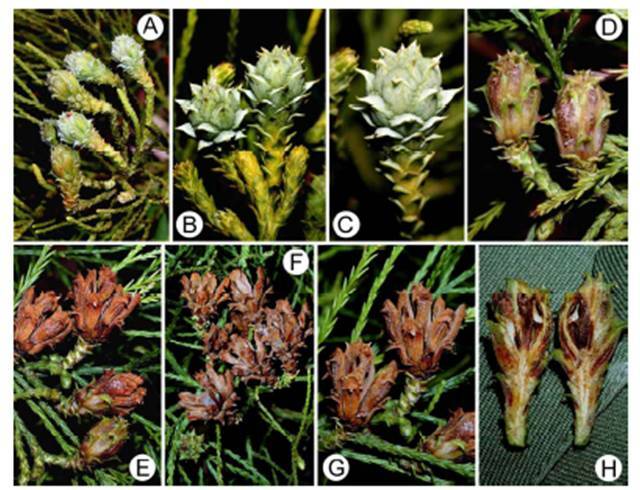 Special scientific program for propagation of G. pensilis for repatriation and cultivation in appropriate habitats can save this unique conifer at least in culture. Such program will have not only scientific, but also high applied significance. Besides excellent fragrant timber, this tree has a very attractive ornamental habit, healthy odor of leaves and is suitable for wide planting near water for dam ground stabilization. Field studies, the results of which are presented in this paper, were funded by grants from Henry Luce Foundation, Vietnam Botanical Conservation Program in Vietnam, U.S.A. National Geographic Society (grant #8074-06 "Exploration of highland flora and vegetation in Lai Chau & Son La Provinces, north-western Vietnam"), American Orchid Society (“Exploration of orchid flora in Laos and allied areas of Vietnam”) and Vietnam Program of Basic Research in Natural Sciences (grant #6.077.06 “Study the conifer diversity of North Truong Son Range of Vietnam and assess of their current conservation status”). 1. Averyanov, L. V., P. K. Loc, N. T. Hiep and D. K. Harder. 2003. Phytogeographic review of Vietnam and adjacent areas of Eastern Indochina. Komarovia. 3: 1-83. 2. Dallimore, W., A. B. Jackson and S. G. Harrison. 1967. A handbook of Coniferae and Ginkgoaceae. 4th ed. St.Martin's Press. New York, USA. p. 729. 3. Decision 32. 2006. Governmental Decree No 32/2006/ND-CP date on 30 March 2006 on the Management of native, threatened, precious and rare plants and animals. Hanoi (no pagination). 4. Farjon, A. 2005. A monograph of Cupressaceae and Sciadopitys. Cambridge Printing, Royal Botanic Gardens, Kew, UK. p. 648. 5. Fu, L.-G., Y.-F. Yu and R. R. Mill. 1999. Taxodiaceae Warming: In: Wu, Z.-Y. and Peter H. Raven (eds.). Flora of China. 4. Cycadaceae through Fagaceae: 54-61. Science Press, Beijing, China. Missouri Botanical Garden, St. Louis, USA. 6. Ho, P.-H. 1999. An illustrated flora of Vietnam. 1. Nha Xuat Ban Tre, tp Ho Chi Minh. Vietnam. p. 991. 7. IUCN. 2001. IUCN Red List Categories: Version 3.1. Prepared by the IUCN Species Survival Commission. IUCN. Gland, Switzerland, and Cambridge, UK (http://www.iucnredlist.org/static/categories_criteria_3_1). 8. Le, K. B. and K. L. Phan. 1984. VI – Taxodiaceae Rich. – Họ Bụt Mọc. In Florae Taynguyenensis. Viện Sinh Vật Học. Hà Nội. Vietnam. 235pp. (in Vietnamese). 9. Lecomte, M. H. and H. Humbert. (eds.). 1907–1951. Flore Générale de l'Indochine Vol. 1-7 & Supplements, Paris, France. 10. Li, F.-G. and N.-H. Xia. 2005. Population structure and genetic diversity of an endangered species, Glyptostrobus pensilis (Cupressaceae). Bot. Bull. Acad. Sin. 46: 155-162. 11. Loureiro, J. 1793. Flora Cochinchinensis. T. 1-2. Impenfis Haude Spener, Berolini, Germany. p. 882. 12. Luu, N. D. T. and P. I. Thomas. 2004. Conifers of Vietnam. An illustrated field guide for the most important forest trees. Darwin Initiative, Hanoi, Vietnam. p. 86. 13. Nguyen, T. H. and J. E. Vidal. 1996. Gymnospermae. Flore du Cambodge du Laos et du Viêtnam. 28. Mus. Nat. D’Hist. Natur., Paris, France. p. 166. 14. Nguyen, T. H., K. L. Phan, N. D. T. Luu, P. I. Thomas, A. Farjon, L. Averyanov and J. Regalado. 2004. Vietnam Conifers: Conservation Status Review 2004. Fauna & Flora International, Vietnam Programme, Hanoi, Vietnam. p. 128. 15. Phan, K. L. 1984. Species of Pinopsida in Vietnam. Journ. Biol. (Hanoi). 6, 4: 5-10 (in Vietnamese). 16. Schmid, M. 1974. Végétation du Vietnam: le massif sud-annamitique et les regions limitrophes. ORSTOM, Paris, France. p. 243. 17. Takhtajan A. 1978. The floristic regions of the world. Nauka, Leningrad, Russia. p. 247 (in Russian). 18. Takhtajan A. 1986. Floristic Regions of the World. Univ. California Press, Berkeley, Los Angeles, London, U.S.A. p.522. 19. Tordoff, A. W., T. Q. Bao, N. D. Tu and L. M. Hung (eds.). 2004. Sourcebook of Existing and Proposed Protected Areas in Vietnam. 2 ed. Birdlife International in Indochina and the Ministry of Agriculture and Rural Development, Hanoi, Vietnam (http://birdlifeindochina.org/birdlife/source_book/source_book). 20. Vidakovic, M. 1991. 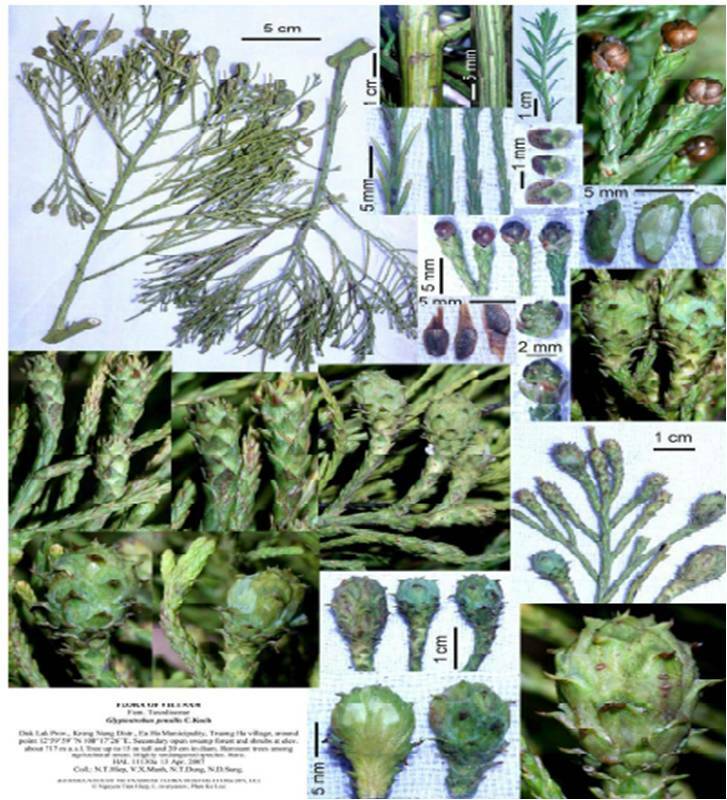 Conifers, Morphology and Variation. Graficki Zavod Hrvatske, Croatia. p. 755. 21. Vu, Van Dung (ed.). 1996. Vietnam Forest trees. Forest Inventory and Planning Institute. Agricultural Publishing House. Hanoi, Vietnam. p. 788. 1. Komarov Botanical Institute of the Russian Academy of Sciences, Prof. Popov str., 2, St. Petersburg, 197376, Russia. 2. Institute of Ecology & Biological Resources, 18 Hoang Quoc Viet, Nghia Do, Cau Giay, Hanoi, Vietnam. 3. Center for Plant Conservation, Vietnam Union of Science and Technology Associations, 25/32/191, Lac Long Quan Rd, Nghia Do, Cau Giay District, Ha Noi, Vietnam. 4. Hanoi University of Science, 334 Nguyen Trai, Thanh Xuan, Hanoi, Vietnam.